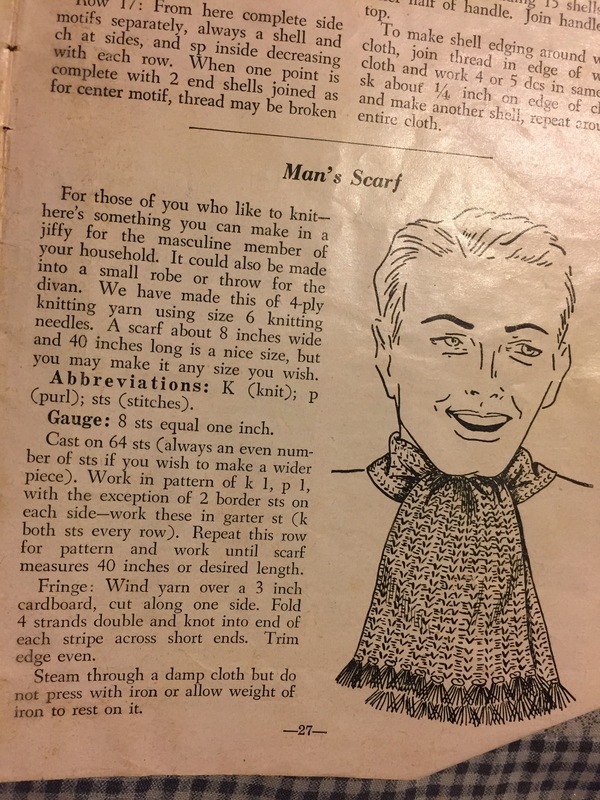 One of the projects I worked on in December, from the December 1948 issue, was the Man’s Scarf. The only problem was that I was working on it as a secret project for my son and could only work on it while he was outside, or at a friend’s house. Well, it gets dark very early in December, so I was not making much progress on the scarf. I intended to have it wrapped as a Christmas present but that just did not happen. I only had about 15″ of scarf on Christmas. So I told my son the plan, showed him the scarf, and stopped working in secret. I cranked it out in about of a week of very relaxed working. In reality you could probably make it in a weekend if you really dedicated yourself. The pattern has a cast on of 64, but I only cast on 56. 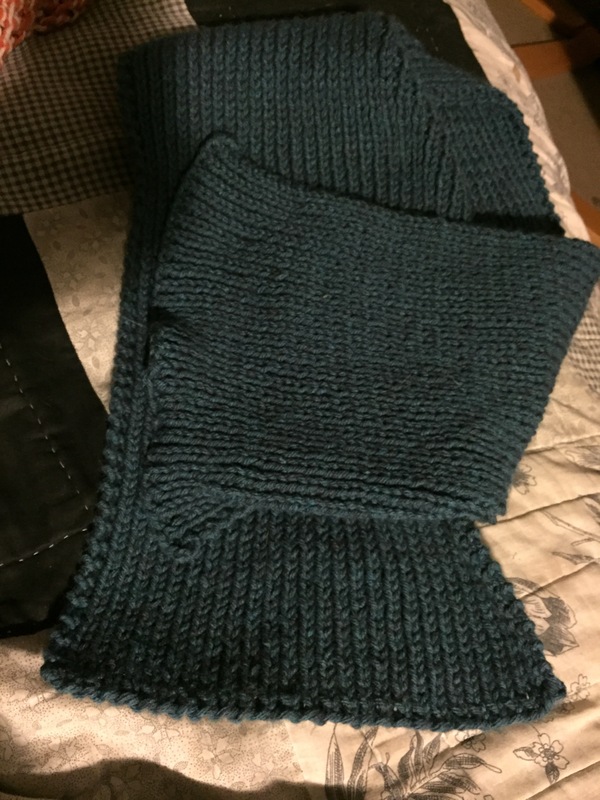 For two reasons, it was already getting very wide and my son is still young, so I didn’t want such a beast of a scarf for him, and two, I did long tail cast on (a personal favorite) and miscalculated how much I needed, so I was running out of long tail. It came out great, and when folded in half it covers the back of his beck perfectly! It’s so flexible and squishy he should be quite toasty with it. He requested no fringe, and I did make it the suggested 4o inch length. I used Bernat Super Value Yarn in Teal Heather. One day when shopping he picked it out and asked me to make him something with it one day. The remainder of the skein is just a tiny bit over 2 ounces, so you can make this with 5 ounces of yarn. The two stitch garter edges prevent curling, and it’s quite plush. It doesn’t appeared ribbed but is more like double thick because of the ribbing. It would make a cozy throw if you were interested in doing it. Don’t forget, if you cast on an odd number but follow the same pattern you’ll make a seed stitch scarf. Hopefully I’ll be finishing a few more December projects over the next few days, and also starting some January ones! If you make a Man’s Scarf, I’d love to see it! Next Post: February Issue Voting!